NOAA’s latest weather satellite, a new-generation geostationary observatory named GOES-S, landed at the Kennedy Space Center’s former space shuttle runway Monday aboard a U.S. Air Force transport jet, ready to begin final preparations for launch March 1 on top of a United Launch Alliance Atlas 5 rocket. Cocooned in a transport container, the GOES-S weather satellite left its Lockheed Martin factory in Denver early Monday, and crews loaded the spacecraft into the cavernous cargo hold of a C-5M Super Galaxy at Buckley Air Force Base to begin the cross-country journey. 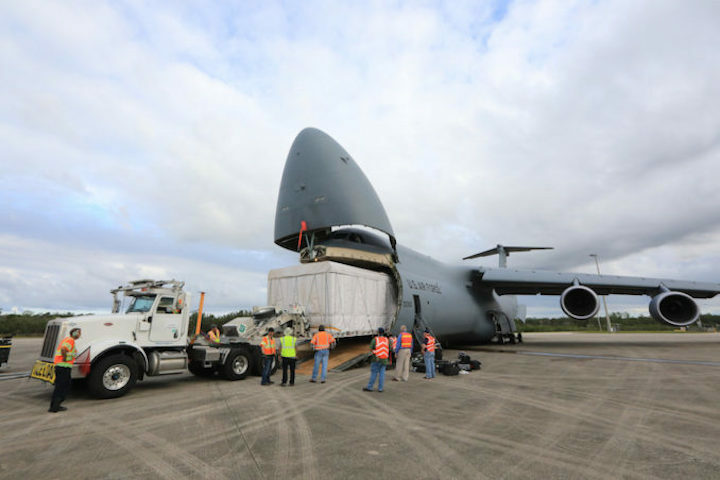 The jumbo jet touched down at KSC on Monday afternoon, and NASA, Lockheed Martin and Air Force teams offloaded the satellite for a truck ride to the Astrotech payload processing facility in nearby Titusville, where it arrived Tuesday. “This is a huge milestone for our program in that we’ve got the spacecraft all built and tested, and it’s ready to go,” said Jeff Coyne, head of Lockheed Martin’s team overseeing GOES-S’s assembly, test and launch operations. 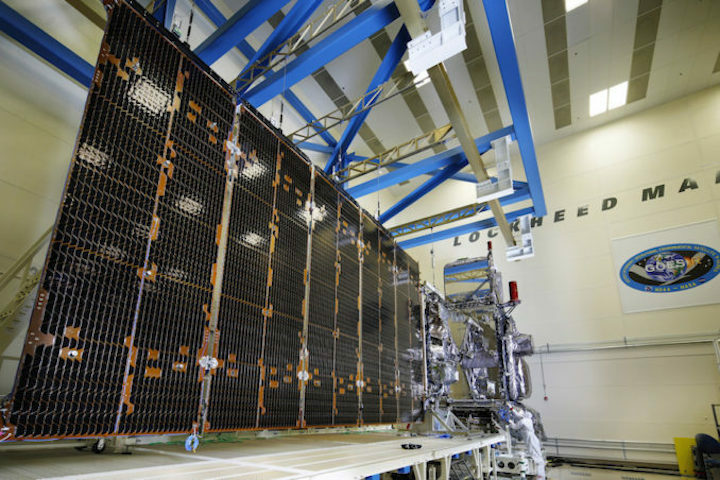 The GOES-S satellite is the second of four upgraded weather observatories built by Lockheed Martin for NOAA. The GOES spacecraft are stationed in geostationary orbit nearly 22,300 miles (35,800 kilometers) over the equator, where they hover over the same geographic position, circling Earth in lock-step with the planet’s rotation. From their high-altitude vantage point, the GOES satellites collect near real-time imagery of hurricanes, storm systems and other weather phenomena to provide forecasters information on their location and movement. The first in the new series of geostationary weather satellites, known as GOES-R before launch and now renamed GOES-16, debuted a more powerful camera that can take higher-resolution images more frequently. The Advanced Baseline Imager, built by Harris Corp., is sensitive in 16 optical and infrared channels — up from five channels on earlier satellites — allowing meteorologists to distinguish between snow, fog, clouds, volcanic ash, and other particles suspended in the atmosphere. The ABI camera can also take images of areas-of-interest as often as every 30 seconds, feeding more timely data to forecasters than possible with earlier weather satellites. The new GOES satellites also carry lightning mappers and a suite of sensors to monitor the sun’s energy output and the space environment, helping to improve space weather forecasts. The modernized four-satellite weather network is expected to cost nearly $11 billion when complete, including NOAA’s purchase of the spacecraft, launch services, instruments and upgrades to ground systems. Liftoff of the GOES-S satellite is set for 5:02 p.m. EST (2202 GMT) March 1 from pad 41 at Cape Canaveral Air Force Station. The spacecraft will ride a ULA Atlas 5 rocket with four strap-on solid rocket boosters into geostationary transfer orbit, an elliptical drop-off orbit on the way to GOES-S’s final perch 22,000 miles over the equator. The launch window March 1 extends for two hours. Coyne said technicians and engineers will spend the next couple of months verifying GOES-S is ready for launch. The GOES-S satellite should be fueled with its mixture of storable hypergolic propellants for its planned 15-year mission by early February, then ground crews will mate the craft with the Atlas 5’s payload attach fitting and encapsulate it inside the rocket’s Swiss-made payload fairing. If all goes well, the fully-fueled satellite — weighing more than 11,000 pounds (5,000 kilograms) — will be transferred to ULA’s Vertical Integration Facility at pad 41 in mid-February for hoisting atop the Atlas 5 rocket. The move of GOES-S comes as ground controllers monitor the planned drift of the GOES-16 weather satellite toward its final operational position at 75.2 degrees west longitude, where it will enter service Dec. 20 as NOAA’s GOES-East satellite covering the eastern United States and the Atlantic Ocean. GOES-16 launched in November 2016 and has completed a year-long test and calibration campaign to confirm the functionality and performance of its instruments. NOAA operates weather satellites in the GOES-East and GOES-West positions, and maintains at least one backup observatory ready to replace one of the primary spacecraft in case of a failure, ensuring uninterrupted coverage of the Western Hemisphere from Guam to the west coast of Africa. The GOES-13 satellite will be moved to a standby location once GOES-16 begins operations in the GOES-East slot. The GOES-S satellite will be renamed GOES-17 after its launch, and officials plan to position it in the GOES-West slot to track weather systems in the Pacific Ocean, Alaska, Hawaii and the western United States.